One of the most prolific and idiosyncractic songwriters of his generation has covered an entire album from one of the most ubiquitous pop stars of her generation, and soon you can own the results on LP or CD! 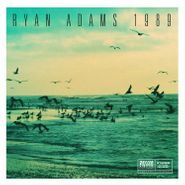 Ryan Adams' full-album cover of Taylor Swift's megaselling 1989 album was an welcome surprise, as Adams filtered Swift's maximalist radio pop into his world-weary Americana style. The album will be released by Blue Note on CD Oct. 30 and on LP Dec. 11. Reviews for the album have been overwhelmingly positive, with Entertainment Weekly's Leah Greenblatt claiming, "If turning the biggest, shiniest pop record of the past year into a survey course in classic rock economy sounds like a novelty, it is. But it’s also the best kind—one that brings two divergent artists together in smart, unexpected ways, and somehow manages to reveal the best of both of them." It's worth noting that Swift's style originally hued closer to Adams'. 1989, with its big-beat Max Martin and Shellback productions, marked a continued evolution from the Nashville-grown sound of her country debut to the electronic dance-pop of her last couple of releases. Hear Adams' version of "Bad Blood" below.